Yet, A3 reports are a relatively new tool. The 77 year history of Toyota suggests that kaizen, not A3 reports, actually lies at the heart of Toyota’s sustained success. Eiji Toyoda, former chairman of Toyota once said, “At Toyota, kaizen is in the air.” Another former chairman, Fujio Cho said, “[Kaizen] is the first word that comes to mind when we think of Toyota.” The current president, Akio Toyoda says: “Kaizen is an unending process. All of us at Toyota share a commitment to that fundamental principle of the Toyota Way.” Helpful as they may be, I’ve never heard anyone say anything like this about A3 reports. Unfortunately, kaizen is poorly understood and has led to organizations doing only a narrow and much simpler subset of kaizen practice. As a result, most organizations do not achieve much in the way of productivity improvement and cost reduction. That is why surveys consistently find that Lean efforts fall short of expectations. The dearth of high-impact results helps explain why management often lays off continuous improvement specialists. Let’s begin by understanding three main types of kaizen: man, material, and machine. What follows focuses on kaizen for the first category, “man.” The same, however, applies to the other two categories. It is within these three areas that high-impact results are achieved, usually in combination with one another. Kaizen was of great importance to Toyota because their productivity was said to be one-eighth of U.S. manufacturers in the years immediately after World War II. In addition, their quality was low and costs were high. To deploy kaizen more broadly across the organization, many people would have to learn industrial engineering methods. 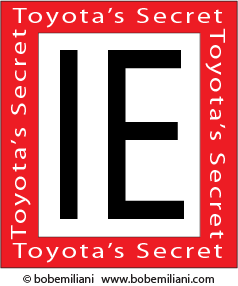 Toyota hired Shigeo Shingo to deliver IE methods training (process analysis, time study, motion study) four times per year beginning in 1956. Toyota people then further developed and improved their IE-based kaizen method. Imai informs readers of the interconnections between kaizen, total quality control (TQC), Quality Control (QC) circles, and other elements of management practice in major Japanese corporations. However, Imai focuses mainly on the relationship between kaizen and quality, with little treatment of the impact of kaizen on productivity and cost reduction. Further, Imai does not give readers an understanding of kaizen’s roots in industrial engineering or the method for practicing kaizen. Readers can easily come to the conclusion that kaizen is company-wide TQC and working-level QC circles and suggestion system. Add to that the way kaizen has been commonly understood over the past few decades, as small or incremental improvements, which results in activities focused on making only small improvements. For many years, people’s understanding of kaizen was very limited because there was no clear description of kaizen. The only way to learn it was to engage a kaizen consultant such as Shingijutsu, beginning in 1987 (See Kaizen Forever and Shingijutsu-Kaizen). It would not be until years later that a few books would appear that describe kaizen accurately in terms of its industrial engineering roots. This is the way you should understand TPS, inclusive of The Toyota Way (and a much better way to to understand both Lean and Lean thinking). There is only one way to do this. It is through the application of industrial engineering methods in tandem with an understanding of the seven wastes: overproduction, waiting, transportation, processing, inventory, motion, defects. That is Toyota’s secret. These are the basics of kaizen that must be mastered. (That’s right, value stream maps are not used in kaizen, nor are A3s or six sigma. Get over it). Many organizations today do not understand that kaizen means to analyze work processes using a stopwatch. Or, they understand that yet choose to do something that will not rearrange both people and work sequence, for fear of upsetting workers or losing buy-in for change. I find this to be true especially in service organizations such as financial services, healthcare, and higher education. You can make that choice, but please recognize that you will gain little in the way of productivity improvement, cost reduction, quality improvement, etc. Said another way, you may accomplish in 10 years what an organization that understands IE-based kaizen will accomplish in one year. QC circles, suggestion system, brainstorming, etc., all all important things for people to do every day, but they are not sufficient of one wishes to survive and prosper in competitive markets. It is akin to you training one hour a day for running 10,000 kilometer race, while your competition trains for 8 hours a day. You’re just not competitive. Therefore, you must do IE-based kaizen as well. This should be the primary focus, ahead of QC circles, suggestion system, brainstorming, etc. There is a reason why organizations such as The Wiremold Company led by Art Byrne and Virginia Mason Medical Center led by Gary Kaplan are widely seen as Lean exemplars: They did kaizen – lots of kaizen of the type rooted in industrial engineering analysis of work, supported by QC circles, suggestion system, etc. They are exemplars because IE-based kaizen is far better at teaching people how to think and learn than A3 reports. For many years, description of the IE-based kaizen method was not available in books. Instead, you had to get this information from people; former Toyota or Toyota subsidiary employees working as kaizen consultants. Today, there are many books with kaizen in the title. Those that make no mention of takt time, cycle time, time study, motion study, standardized work, etc., are confusing QC circles, suggestion systems, brainstorming, etc., with IE-based kaizen. Such books will not be of much help to you. There are two books that describe Toyota’s kaizen method. The first is Toyota Kaizen Methods: Six Steps to Improvement (2011) by Isao Kato and Art Smalley. It is an excellent resource and clearly illustrates the connection to industrial engineering-based analysis of work. The second is Kaizen Express: Fundamentals for Your Lean Journey (2009) by John Shook and Toshiko Narusawa. It gives a very nice, concise description of TPS what will help focus you in your kaizen efforts. The Appendix shows you the forms and how they are used in kaizen. These books should be at the top of your list to buy, read, re-read many times, and put into daily practice. Please go back to the basics and master the basics. Finally, please reflect on the wise words of Fujio Cho: “The philosophy that makes [kaizen] possible is ‘Respect for People’.” Kaizen means IE-based process improvement that improves the human condition. Note: There has been declining interest in industrial engineering among business leaders over the last 30 years as manufacturing-based economies shifted to service economies. This, unfortunately, is a big mistake. Business leaders should be very interested in industrial engineering no matter what type of business or industry they are in. As interest in industrial engineering declined, interest in Lean increased. However, one cannot understand TPS or Lean without knowing about industrial engineering. This informs us of why so few businesses have been able to replicate Toyota’s success. So, start training your people in IE methods and never lose sight of the “Respect for People” principle in the application of Toyota’s IE methods. I’m delighted that “respect for people” is highlighted here. As a former Danaher and Wiremold employee, I’ve seen that in the “rush to complete a kaizen”, the input of all team members is frequently overlooked. I’m curious as to how much of the kaizen training focuses on to recognize the communication styles and needs of all to improve the team communication and collaboration. Would this type of training be of value to these teams? Bob, are there organizations or programs that you know of that utilize the books you mentioned in some sort of formal training for kaizen? Not sure which books you are referring to. Some people do classroom kaizen training with the book Toyota Kaizen Methods by Kato and Smalley. The Lean Enterprise Institute’s classroom kaizen course uses Kaizen Express by Narusawa and Shook. It is best to learn kaizen on the shop or office floor. On my first few visit to Japan to study the Toyota Production System, I quickly appreciated that they had developed their own form of ‘Scientific Thinking’. The main difference to the Taylor model was that they had engaged all their people positively in the process. Let us hope our present improvement methodologies have as much impact on human prosperity in the next one hundred and thirty years, as those of Taylor and the Gilbreths have done over the last one hundred and thirty. * Motion and time study is the analysis of the methods, of the materials and the tools and equipment used, or to be used, in the performance of a piece of work – an analysis carried out with the purpose of 1) finding the most economical way of doing the work; 2) standardising the method, materials, tools and equipment; 3) accurately determining the time required for the average worker to do the task; and 4) training the worker in the new method. From – Motion and Time Study by Ralph Barnes. 1937. My favourite book on the subject, it sits next to my copy of Shingo’s green book.